1. What does ‘Daybreak’ mean? 2. What type of poem is ‘Daybreak”? 4. Whom does the wind first address in the poem? 5. Whom does the wind tell to make room for him ? 6. Whom does the wind hail on the sea? 7. What does the wind advise the mariners? 8. “Sail on, Ye mariners, …” – What does the word ‘Ye’ mean? 9. “And hurried landward far away” – Why is the wind in haste? 10. What does the wind say to the forest ? 11. “Hang all your leafy banners out !” – What are ‘leafy banners’? 12. How does the wind try to awaken the sleeping bird? 13. “It touched the wood-bird’s folded wing” – What does the expression ‘folded wings’ signify? 14. What does the wind ask the wood-bird to do? 15. How can ‘chanticleer’ herald the arrival of the daybreak? 16. What is the ‘clarion’ of the chanticleer? 17. What is the meaning of ‘clarion’? 18. Why does the wind ask the fields of corn to bow down? 20. “Proclaim the hour.” – Who is called to proclaim the hour? 21. Where does the wind finally reach? 22. How does the wind express his sorrow for the dead ? 23. What does the wind tell the dead souls lying in the grave? 24. Give an example of ‘personification’ from the poem. (i) The poet personifies the wind in “Daybreak”. How does he do this ? Or, How is the wind personified in Longfellow’s poem “Daybreak”? Or, Describe the activities of the wind as you find in Longfellow’s poem “Daybreak”. Or, Give an account of the activities of the wind in the sea and on land as described in Longfellow’s poem “Daybreak”? Or, Discuss the journey of the wind, carrying the message of daybreak in Longfellow’s poem, “Daybreak”. (ii) Explain the significance of the title of the poem “Daybreak”. 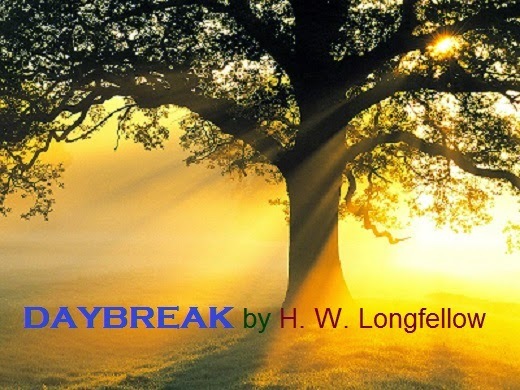 (iii) Consider Longfellow as a poet of Nature with reference to the poem, “Daybreak”. Or, What picture of dawn does the poem ‘Daybreak” present?